What are your younger employees thinking about IT Policies? Cisco has released their “Connected World Technology Report 2011“. This was a worldwide study of 1,441 College Students (age 18–24) and 1,412 End Users (21–29) who completed an online survey between May 13 and June 8, 2011. The study covered 14 countries with about 200 entries per country. The End Users were screened were college graduates or higher, employed full time in a non-IT role, and worked for an organization that employs 10+ people worldwide. The purpose of the study was to examine the behavior and expectations of the world’s next generation of workers and how their demands for information access are changing business communications and the future of work. One of every three college students and young employees believes the Internet is as important as air, water, food, and shelter. Two of five said they would accept a lower-paying job that had more flexibility with regard to device choice, social media access, and mobility than a higher-paying job with less flexibility. Regarding security-related issues in the workplace, seven of ten employees admitted to knowingly breaking IT policies on a regular basis, and three of five believe they are not responsible for protecting corporate information and devices. When looking into the detailed answers of End Users from the US, your current employees, some things definitely pop out. When asked, US End Users were split evenly on whether their company should give the same equipment to everyone, or they should be given a budget to buy their own equipment, or they should have company supplied equipment but be able to use their own devices at work. Over half thought they should be able to access their corporate network from their home computer and nearly as many thought they should be able to from personal mobile devices. A third thought they should be able to access the corporate network from any computer anywhere. In an answer to that expectation, over half the End Users could access their corporate network remotely, but not always from all locations. In deference to their international colleagues, nearly two-thirds US End Users would take a higher salary over the ability to work remotely. About a third of US End Users report their company restricts access to Online games and Social Networking sites. Of those restricted, a third thinks it would be nice for work/life balance issues if these sites were available. While nearly as many think that they and their co-workers would waste a huge amount of time if the sites were available. 40% believe that their company IT policies need slight improvement or updating. Even though, over half believe the company policies are fair. Only 34% always follow their company IT policies while another 53% say they follow those policies most of the time. 64% of those that break the company policies believe that they are doing nothing wrong. Most of the US End Users responding to the survey were between the ages of 25 and 29. Half of the End Users worked for companies with more than 750 people. A third of the respondents worked for companies with less than 100 people. So what can be drawn from this study? From the employee’s point of view, remote access is desirable and may lead to better productivity. There is no real consensus on who should supply end user equipment, but employers should be looking at or developing policies on Bring-Your-Own-Device (BYOD) questions. But for most employees in the US, pay is more important than remote access and flexibility. Employers should recognize that they need to define policies. Those policies can be restrictive if fair. Once policies are defined, they need to be updated on a regular basis. Be aware that younger users expect more in IT connectivity. They will basically follow the rules if the rules seem logical. Otherwise, they will find a way around them. Times have changed. If you aren’t already doing it, you should look at restricting Internet access during your work day. Tomorrow may be too late because expectation of access is already there. Make sure your employees understand their responsibility for the security of the company’s data and equipment. I’m not really one to push donations for charities, for that matter I don’t like doing collections! But when I received the call from MDA to join their Lockup fund raiser to support MDA Summer Camp, I decided that this was one time I could reach out to ask others to donate their hard earned money. MDA Summer Camp holds a special place in my wife’s and my heart. For those of you that don’t know, I had three brother-in-laws with Muscular Dystrophy. I never knew them not to be quadriplegics resigned to live life in a wheelchair. The” boys” would come back a haunt me if I made this into a “feel sorry for them” piece. So let me just say that high point of every year for them was the MDA summer camp. MDA Summer Camp gives both the families and those stricken with the disease a chance to have a “normal” life for a week each year. The campers get to have a week away from their families and to have as normal a camp experience as they are able. Think about what it takes to take a person in a 500 pound wheelchair out on a boat to go fishing. Then have to do everything for that person because they don’t have the ability to do it themselves. That is what MDA does for the campers. The aides that work MDA camp are really dedicated to their charges. 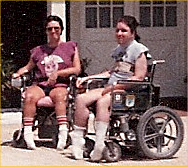 Two aides once flew to Florida on their own dime to drive one of my brother-in-laws (one was in the hospital at the time and the other had died) from Tampa Florida back to Chicago for “Adult” camp (most those stricken with the disease never live to adulthood). Back then, Chicago was the only location in the country that ran an Adult camp, now there are none. For the families, they get a week where they do not have to plan their lives around doing for someone that can’t do for themselves. This gives them a chance to live like you and I do on a daily basis for just a short time. I need your help to reach my bail! The MDA Lock-Up takes place on 09/26/2012, but I’m raising my bail before I go to jail! All you have to do is click here to make a secure, online donation today. Your support will help families living in our community with muscle disease, and help guarantee that I get out of jail. I will be sure to add you to my list of contributors. Please support me in this important goal by visiting my fundraising page and making a contribution. Your tax-deductible donation makes a difference to the hundreds of kids, adults and their families who live right here in our local community.